For once in my life, I am thankful that I don’t own nice stuff. There is sharpie on the couch cushions, scratches all over our tables, unidentifiable food stains on my shirts, and I think every game in our closet is missing at least one piece. Motherhood is teaching me a lot about detachment and that objects are just objects. It’s the people and your experiences that can’t be replaced. But I’m learning not just about material detachment from objects, but detachment in other areas such as sleep, plans, and social events. I’m not going to be able to go out whenever I want. I’m not going to get to sleep through the night. I’m not going to be able to get my whole To Do list done today, so I better just embrace my cross and die to self. So here’s to detachment. Thank you, children, for helping me to realize what it means to be truly free. Is There Makeup In Heaven? I really tried hard in high school to rid myself of my insecurities about being beautiful and let God love me, but it was hard! I had been teased and bullied so much in my short lifetime thus far that there was a lot about me that I hated, and looking in the mirror and thinking I was beautiful never happened. I guess I just figured when you grow up and become an adult you don’t care what people think anymore. I was wrong. In college I challenged a friend of mine to go to daily mass every day for a month. He said he’d do it if I didn’t wear makeup for that same month. Daily mass I could do, but no make up? How was I going to have any friends or be able to leave my dorm room? Because I cared about his soul, I did it. And you know what? People didn’t treat me any different. I still hung out with the same friends, no one ever said anything about me being ugly, and over all I saved myself at LEAST several hours of getting ready. Make up isn’t bad, but it can be if we are using it to hide our insecurities or try to cover up who we really are. Will my husband still love me if I don’t look pretty? Will somehow I be less of a mother if I can’t put out a good image? These are things I still struggle with sometimes. If you absolutely can’t leave the house without putting on your face or wearing a nice outfit- even to run errands or go to the park- something might be wrong. If you can’t stand to look at yourself in the mirror without hair and makeup done, than there is probably some healing that still needs to take place. I certainly don’t want to pass on these insecurities to my daughter and give her the wrong idea that she will need makeup to be beautiful, either. Makeup can accent our beauty, but God didn’t design us to need makeup to be beautiful. He made us beautiful as we are, plain and simple. I think the best thing we can do is look to Mary as our model. I’m sure she never wore makeup, and she will always be the most beautiful woman that ever lived. 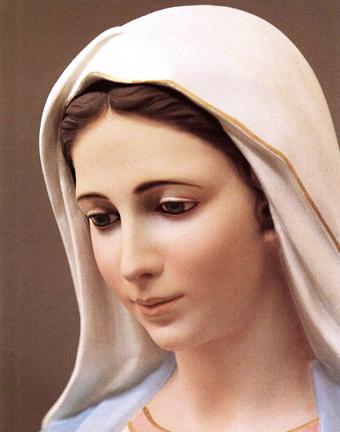 The visionaries of Medjugorje describe Mary as beautiful beyond anything of this world. When asked how is it that she is so beautiful Mary responded, “I am beautiful because I love.” And when all of our sinfulness and insecurities are purified and we stand before the throne of God, we won’t need makeup in heaven!! We will all be transformed into the perfect, beautiful, and glorious image of God. Makeup, fashion, accessories- in and of themselves are not bad. But they need to be ordered to what is true and good and holy first. They need to be balanced with cultivating the inner virtues of womanhood. Like Mary, let’s be beautiful because we love.